Welcome to Paramount Antique Malls and Paramount Marketplace! Paper Ephemera, Vintage Clothing & Collectibles. Since 1999, Paramount Antique Mall's have offered the very best in service and expertise to our customers. Paramount Marketplace is an authorized retailer for Fusion Mineral Paint. Located at 13th & Woodlawn in Wichita. Fusion Mineral Paint is your go to DIY Furniture and Decor Paint All in One. Come see our great selection of paints and finishes. Paramount Antique Mall in West Wichita features 40,000 sq. 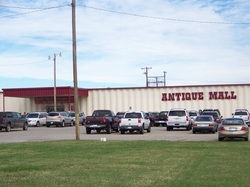 ft. and over 225 booths, making it one of the largest antique malls in Kansas. Paramount East Antique Mall, our 2nd location, features 22,000 sq. ft. and over 125 booths. Paramount Marketplace, our newest location is located at 13th & Woodlawn in Wichita has over 200 booths in 35,000 sq.ft. Antiques & vintage goods plus new home decor, furniture, fashion, jewelry & gifts. Outdoor Vintage Markets , All Paramount locations (Wichita & Augusta KS) host monthly Outdoor Vintage Markets April through October. Get Email Updates About Paramount Events!